"I was fighting for the living! I loved my country!" Lionsgate UK has debuted the first official trailer for a modern spy drama titled Red Joan, telling the true story of Joan Stanley, who was exposed as the KGB's longest-serving British spy. This premiered at the Toronto and Zurich Film Festivals last year and is opening in the UK this spring, but still doesn't have a US release yet. Judi Dench stars as "Red Joan", who first became a spy as a Cambridge physics student after falling for a young communist. Working at a top-secret nuclear facility during WWII, she realizes it's perhaps better for her to work as a mole in order to hopefully reach peace. That's a very intriguing premise, and I'm curious to see how the film portrays the challenging decisions she had to make. In addition to Dench, the cast stars Sophie Cookson as the younger version of Joan, with Tom Hughes, Stephen Campbell Moore, Kevin Fuller, & Stephen Boxer. Give it a look. The year is 2000 and Joan Stanley (Judi Dench) is living in contented retirement in suburbia at the turn of the millennium. Her tranquil life is suddenly disrupted when she’s arrested by MI5 and accused of providing intelligence to Communist Russia. Cut to 1938 where Joan is a Cambridge physics student who falls for young communist Leo Galich and through him, begins to see the world in a new light. Working at a top-secret nuclear research facility during WWII, Joan comes to the realisation that the world is on the brink of mutually assured destruction. Confronted with an impossible question – what price would you pay for peace? - Joan must choose between betraying her country and loved ones or saving them. 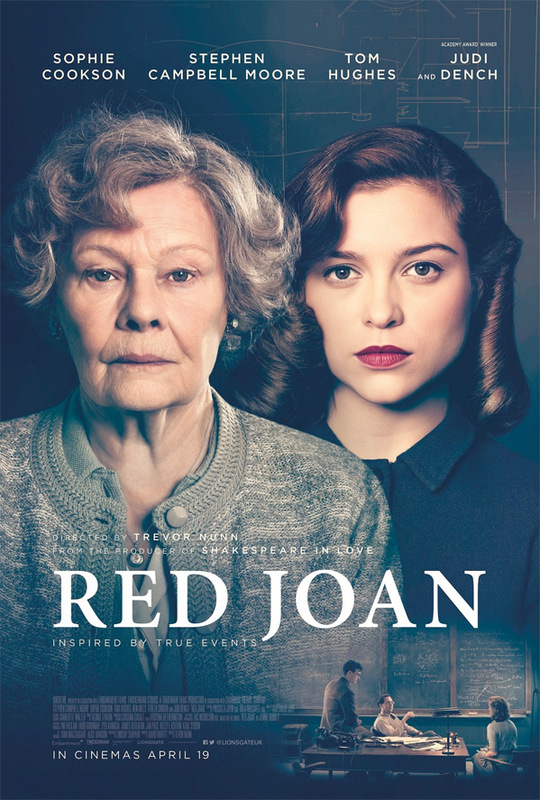 Red Joan is directed by English songwriter / filmmaker Trevor Nunn, director of the films Hedda, Lady Jane, and Twelfth Night or What You Will previously. The screenplay is written by Lindsay Shapero. This first premiered at the Toronto and Zurich Film Festivals last year. Red Joan opens in UK cinemas starting April 19th this spring. There's still no US release date set yet. First impression? Who's interested in seeing this?